Even while enjoying the beats, these little mysterious creatures are stacking on top of one another to be together. 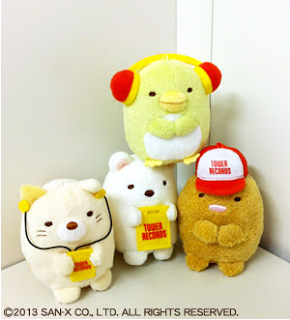 Hokori-chan is just chilling on the wall, Zasou is sticking on the wall, Tapioca-chan is wearing a Tower Records cap makes everything look so comfy! 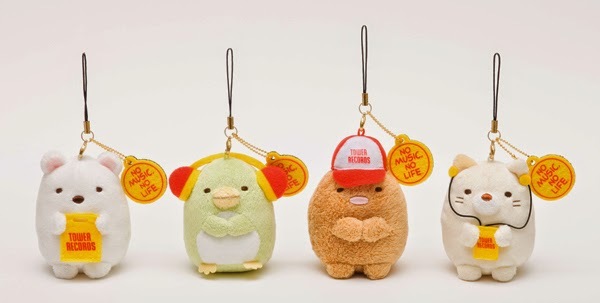 Shiro Kuma, Penguin, Tonkatsu and Neko released a set of hanging charm and plushies back in 2013 for this collaboration. Even though there isn't a dramatic difference from what they usually look like but the additional colors on them makes the set pop! Now I am kinda regretting not liking them sooner :( Oh well, better now than never!